Now the Standard has left (see yesterday’s blog), there’s a huge space available in the garage to begin a task I’ve been needing to do for some years; sort my books. 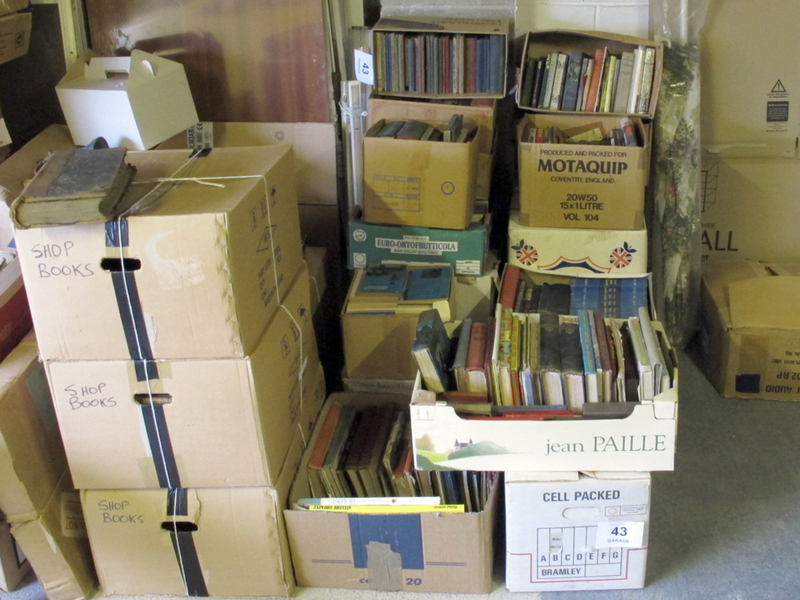 I’ve been hoarding books for years, accumulating them from all manner of sources, but the twenty or more boxes we see here have been in storage for the last seven years, so do I really need them? I’ve made the decision, they’ll have to go but first I need to have a look through just in case there’s something in there of a personal or sentimental nature. I shall probably add to the boxes as well, as in the house my extensive library needs thinning to relieve me of the books I no longer wish to keep. As well as the twenty boxes of books there’s also three boxes of shop books. Now these are full of the shop accounts and ledgers of nearly ninety years of trading, the books from the latter years are fairly dull and uninteresting but there are also a few ledgers from when the shop, Stokes & Sons, was first taken over by my great-grandfather in 1896, and these provide an insight into how the business was run on a day to day basis. One of the most interesting is the customer account ledger which has separate pages for each customer who had their own account. It details on one side of the page the customer’s acquisitions and on the other side the payment dates and amounts still outstanding. There are a number of well know Bridgend (and area) names in the ledger including Picton-Turberville of Ewenny Priory, R H Stiles of the Brewery and Brogdens of Porthcawl as well as countless ordinary individuals. 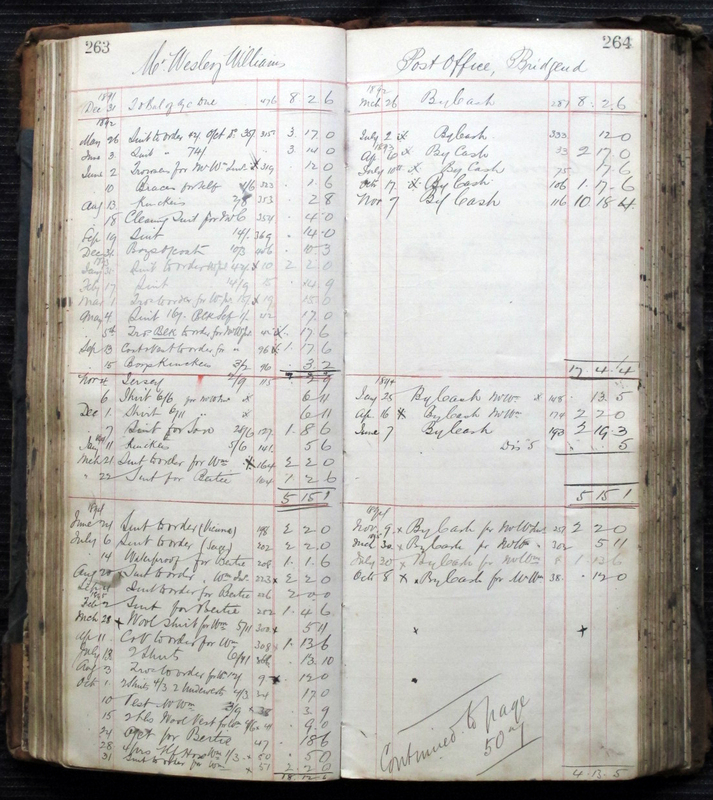 This particular ledger covers the period from 1893 to about 1915, but it is rather complicated to follow as when customers closed an account their page was allocated to someone else and once the page was full there’d be a little arrow at the bottom of the page followed by a page number showing where the account was continued. This really is an interesting, and I suspect, an important social document of the early history of trading in Bridgend. 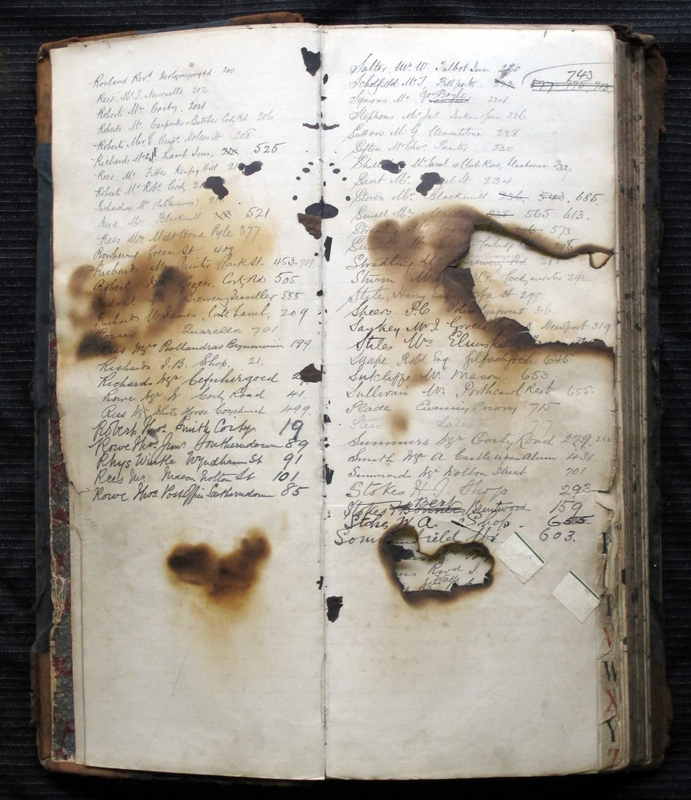 I expect that some of the slightly later ledgers will also contain many interesting facts about the community the shop served in its 120 years history, opening as Easts in 1860 and from 1895 as Stokes & Co, later Stokes & Sons. The business closed in 1980 on the retirement of my father and the few remaining years of the lease were sold to another Gents Outfitter. Thank you Charles but, having been bitten by the collecting policy of one museum who shall be nameless, I shall make sure that this ledger will only go to a place where its future will be secure and it won’t be sold on to a private collector to raise funds! Really interesting and well done on keeping everything so tidy!